This tool will convert a period to an equivalent frequency value by calculating the number of cycles per unit period of time from the time it takes to complete one full cycle. 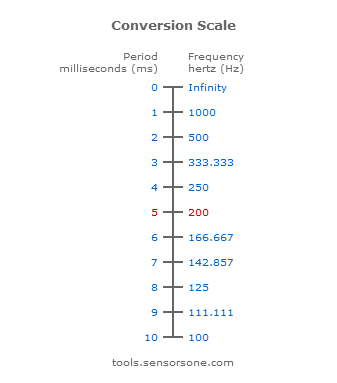 For each new period entered an updated conversion scale will display with a range of period to frequency conversion values centered around the converted frequency. Enter the amount of time it takes to complete one full cycle. This is the number of cycles per unit period of time which corresponds to the entered time period. What are the Hz values for a period varying from 1-10 ms?